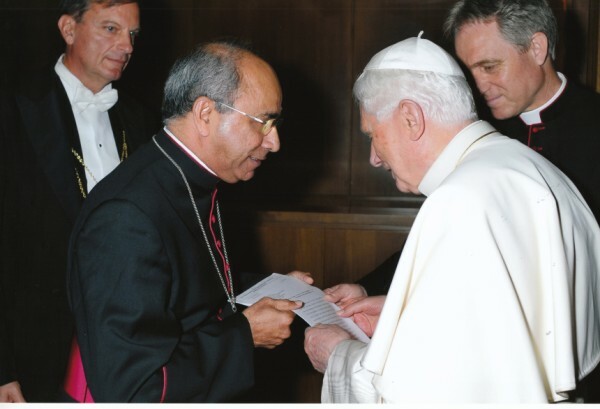 Bishop Bosco Puthur of Foratiana and participant in the Synod for the Middle East, describes to AsiaNews the situation of the 400 thousand Syro-Malabar Indian immigrants who work in the Persian Gulf region. For the bishop, the faithful immigrants in Arab countries are moving away from the Church in the absence of parishes and the lack formed clergy. Rome (AsiaNews) - The situation of the Christian migrants in the Arab countries is among the most important issues discussed at the Synod Churches for Middle East being held in Rome. With over 400 thousand out of 3 million Christians faithful emigrant in the countries of the Persian Gulf, the Indian Syro-Malabar according to tradition founded by St. Thomas the Apostle, is among the most important communities in the region. Its presence in the Arab countries, however, is threatened not only by the restrictions typical of Islamic states, but include inadequate attention to the pastoral problems and social rights of the faithful who come from India to work in the region. AsiaNews proposes the intervention of Syro-Malabar Bishop Bosco Puthur of Foratiana (Kerala) a member of the Synod Assembly. The prelate stresses that the lack of catechesis and religious sites are distancing many faithful from the Catholic Church and calls for greater attention from the Holy See to this community. “I would like to bring to the attention of this august assembly certain pastoral problems indicated in the Instrumentum Laboris Nos. 49 and 50, which read: “A new and important phenomenon taking place in Middle Eastern countries is the arrival of hundreds of thousands of immigrant workers from Africa and Asia…These people are subject to social injustice…This immigration calls for the attention of our Churches which have the pastoral responsibility to assist them in both religious and social matters”. The Syro-Malabar faithful have been present in the Gulf Region since 1960s. They fully depend upon the Latin Vicariates of Kuwait and Arabia for their pastoral needs. These ecclesiastical structures created in the twentieth century for a few thousand emigrants are not at all adequate to take care of millions of faithful now present in the region. We gratefully acknowledge the efforts of the two Vicars apostolic of the region. However, the situation of the pastoral care of the Syro-Malabar faithful in the Arabian Gulf countries is very inadequate and unsatisfactory. There are almost 4,30,000 Syro-Malabar migrants in the region (Saudi Arabia 190,000; UAE-110,000; Oman 45,000; Kuwait-40, 000; Bahrain 35,000 and Qatar 10,000. ), but not even a single parish is erected for them. There is no proper pastoral care and faith formation-catechesis for the Syro-Malabar faithful according to the proper ecclesial tradition, except in Doha. The Syro-Malabar hierarchy is not at all involved nor invited for this purpose. The only church that was built for our faithful in Doha is not even erected as a parish, but remains an outstation of the Latin parish. Besides, serious restrictions are placed on the Syro-Malabar Hierarchy through a ‘Rescript’ from the Holy See, which prevents any involvement of our Church for providing proper pastoral care to our faithful in the area. The community is in a precarious situation and many of them have become indifferent to the practice of Catholic faith. As there is the inadequacy in the pastoral care, there is the ever growing danger of our people being led astray by Pentecostal groups thriving in the Gulf region. Hence it is essential to entrust the pastoral care of the Syro-Malabar faithful to our own Church, erecting proper ecclesial structures and granting jurisdiction to our hierarchy. Contrary to the opinion generally circulated by some ecclesiastics, the governments in the Gulf Region are in general open to the Christian communities, since at present they need emigrant workers. In this situation, the Syro-Malabar Church proposes to the Apostolic See to take immediate and appropriate action to establish at least one eparchy/ exarchy in the Gulf region for the Syro-Malabar faithful. The proposed ecclesiastical unit may cover the present ecclesiastical territories of the Vicariates of Arabia and Kuwait. Politically this includes the countries of Qatar, Bahrain, Oman, UAE, Saudi Arabia and Kuwait. The Seat may be Doha, the Capital of Qatar. Here we have the only Syro-Malabar church in the Gulf region and Qatar is relatively open and politically rather liberal. Geographically, it is the most accessible to all in the region. We hope and pray that the Apostolic See may take appropriate action to redress the grave situation in the region and enable all concerned to provide adequate pastoral care to our faithful in accordance with the liturgical and spiritual tradition of the St Thomas Christians”.